"a movie that successfully celebrates the pillar of English Literature by honouring a man asking for his family’s forgiveness"
The story shows Shakespeare’s return to Stratford-Upon-Avon after the infamous fire that destroyed the Globe Theatre in London. Ready to settle into his retirement close to his family, Shakespeare is immediately overcome by a sense of nostalgia and mourning for the loss of his son Hamnet, who died of the Black Plague while he was in London. Shakespeare's need to reach closure and the memory of his son, brings sorrow to the whole family, especially Judith, who feels responsible for the death of her twin and arbors feelings of disappointment and resentment towards her father. Throughout the film, the family tries to overcome their differences in their own way and remember their love for one another. 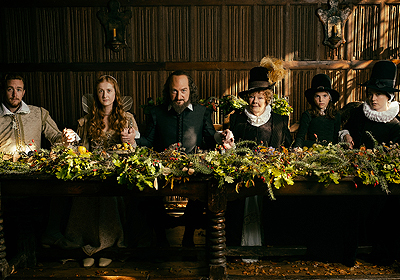 Directed and interpreted by Kenneth Branagh, All Is True is clearly a love letter from the actor to his idol; after directing many of his plays 3 years ago in London, once again Branagh decides to celebrate the Bard by portraying Shakespeare during his final years. As a director, Branagh has a specific style which turns every movie into a theatrical play; the scenography and its colours makes every scene vivid, almost real and tangible to the audience's eyes. The actors move into a specific dance reserved for the greatest stages around the world and the tempo given by all in the rich dialogue is delivered masterfully by the cast ensemble. As a creature of habit, Branagh always chooses to work with a cast ensemble that is familiar to him and already tested both in theatres and on screen; Dame Judi Dench plays Shakespeare’s wife effortlessly. A strong woman who, after many years spent taking care of the household by herself, has to share her roof and bed with a man she only knows as the brilliant theatre director. Her chemistry and level of trust with Branagh is something that can only be achieved after many collaborations, working together on stage and screen. Their respect for one another slips through their performances, giving a more realistic feeling to their portrayal of a married couple. Branagh himself is the only actor who can play Shakespeare with such deep understanding; his performance is heartfelt and honest. Rather than showing a man at the peak of his glory, this time, the audience is introduced to a more fragile Shakespeare. The Bard is at the end of his fruitful career, but his return home is not filled with celebration and honour. The poet has to finally face the demons from his past, especially the loss of his only son. Branagh thrives in portraying the poet’s anguish and regret until the very end, in which solace and forgiveness accompany the Bard’s last moments. Although this film is a biographical romanticisation of Shakespeare last years, All Is True is a movie that successfully celebrates the pillar of English Literature by honouring a man asking for his family’s forgiveness after giving all of himself to his craft.